Welcome to the village of Kleinich with its 8 separate hamlets. 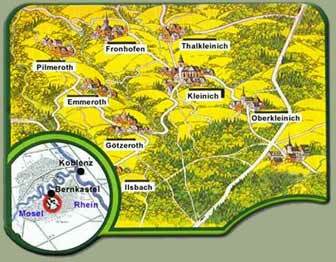 Our house is in "Oberkleinich" which has about a 100 inhabitants. You can find more information about Kleinich on the website www.kleinich.de. Kleinich is a small village, right in the middle of the Hunsrück, surrounded by woods and meadows. On our terrace with its exensive views of this wonderful countryside you can relax and let the days slip by. Or you can explore the many hiking trails in the surrounding countryside. We also have a total of 25 miles of bicycle trails.